Glen Road above Camps Bay. 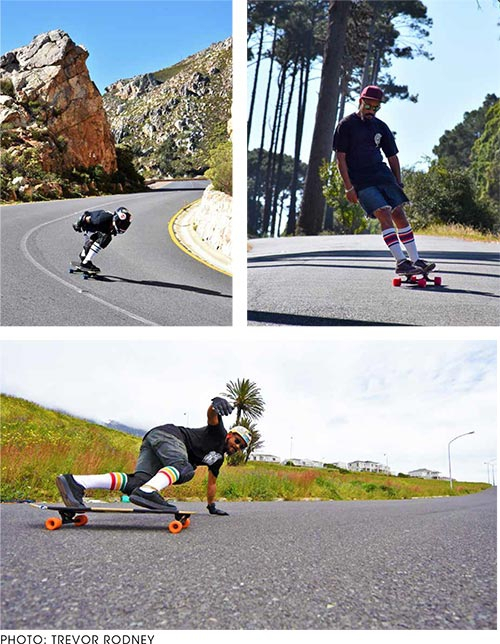 American and European longboarders in protective gear gathered on the mountain above a long winding road that leads to the sea. 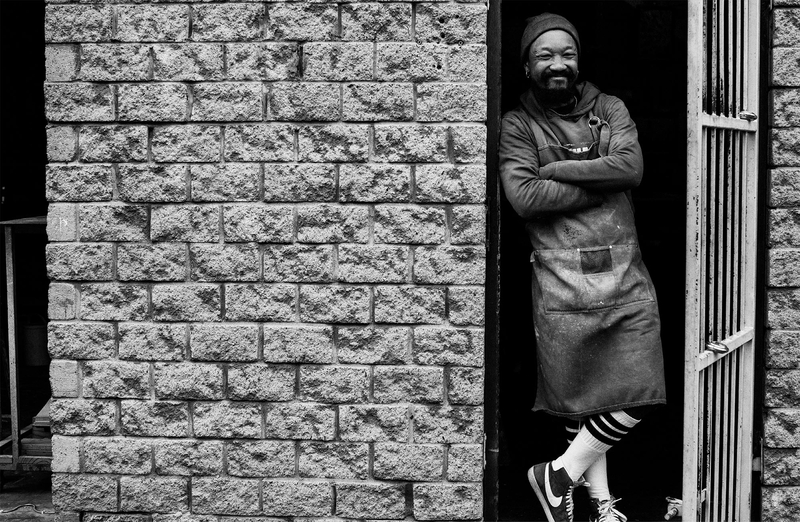 A boy, age 19, stood among them; he was from the suburb Cape Flats. He wore shorts and a T-shirt with long socks sticking up from his Adidas shelltoes. The competition would start soon. And the young man in just shorts and T-shirt would participate – on his usual skateboard. Kent Lingeveldt was the odd bird on the mountain. Five years earlier on his 14th birthday, his cousin gave him his first skateboard. His cousin’s old board launched the start of Kent’s career. 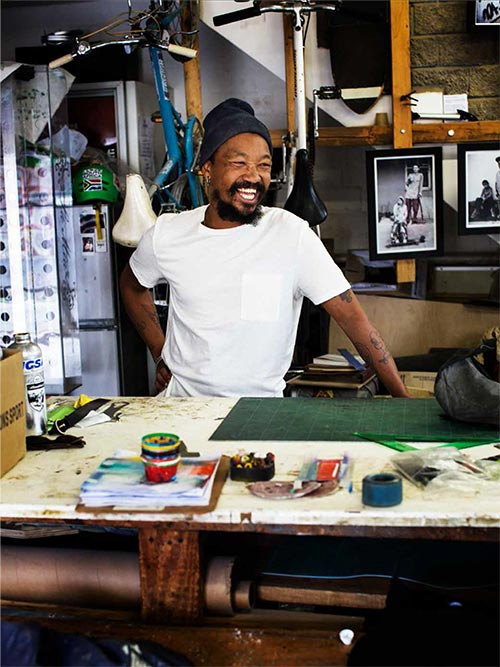 In 2018 – 24 years after he got his first skateboard – we visited Kent at his workshop in Woodstock, Cape Town. 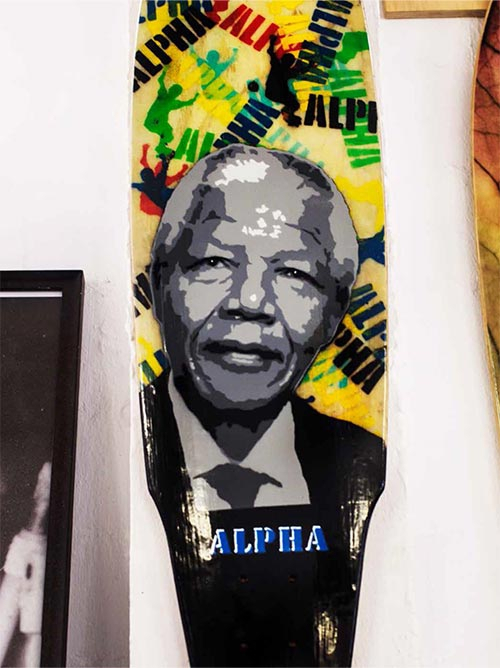 Here, he creates unrivalled longboards under the Alpha Longboards brand. 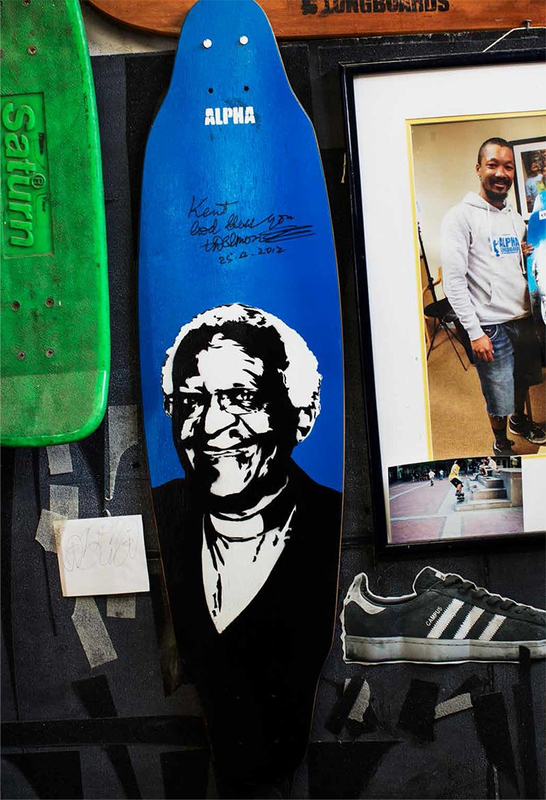 He is probably the best board builder in South Africa – and completely self-taught. 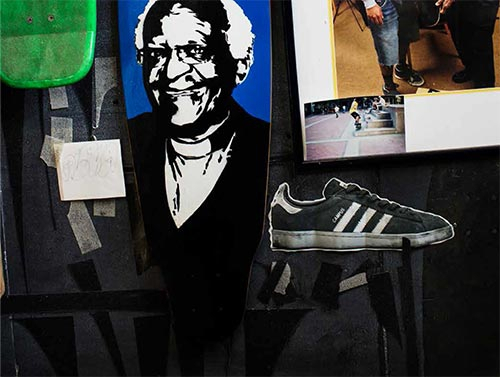 Since 1994, skateboarding has been a natural part of his life and career. Kent was a loner, a guy who never liked team sports – or being one of many in a crowd. He’s forged his own trail since he was a young man. 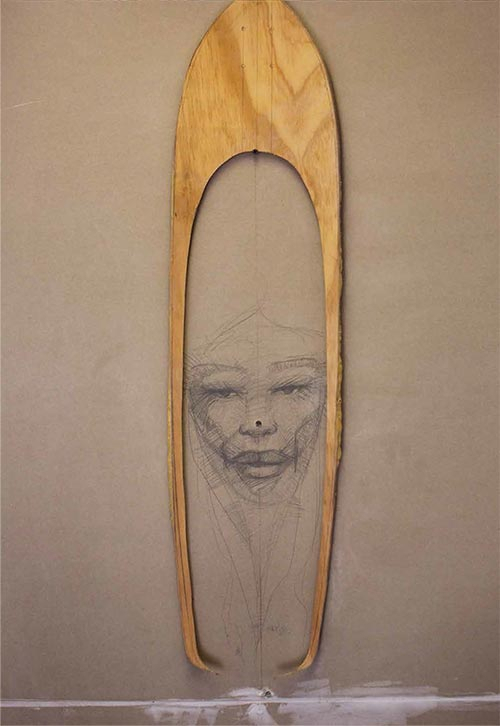 The skateboard became his key to freedom. 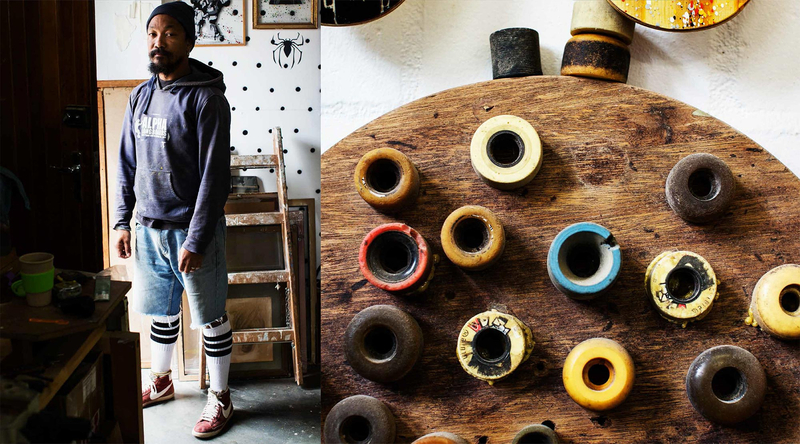 “Skateboarding made complete sense to me,” he explained. 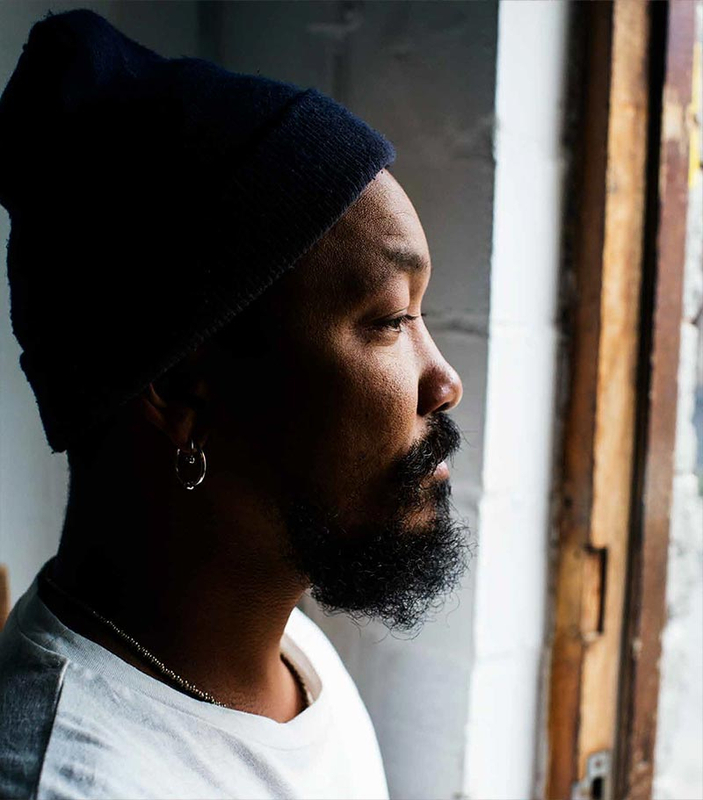 “I could do this on my own, and it was connected with freedom. The skateboard meant I could explore areas beyond where walking could take me. 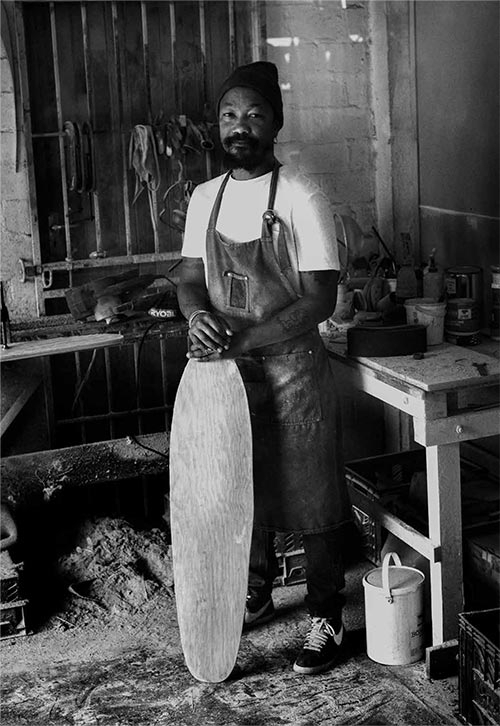 It was freedom on wheels.” Kent is the founder and owner of Alpha Longboards. 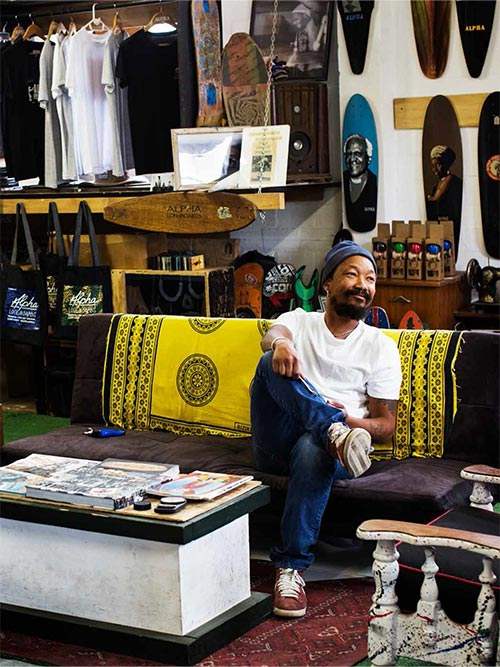 He started his career as a board builder in 2001 – without any experience – simply because he couldn’t afford to buy expensive factory-made boards. Kent bought the cheapest plywood he could find and got to work. Back then, the worldwide web wasn’t the information gold mine it is today. So he had to teach himself. By talking to carpenters and boat builders, he learned how to shape the plywood the way he wanted it. He bought wheels and trucks. He said that he frankensteined the board together. And it worked, and Kent’s new career as shaper and board builder was launched. 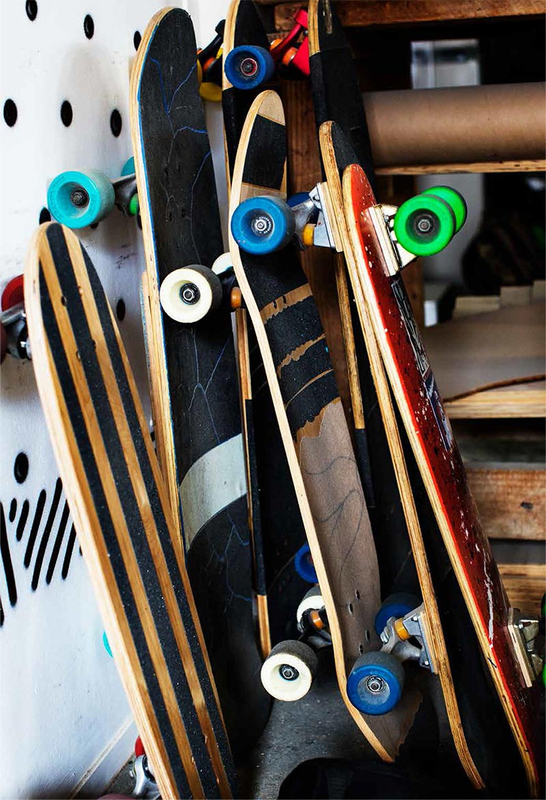 Kent observed that there were many young boys and girls who never wanted to skateboard but willingly started with longboard. They didn’t need to be so cool and do a lot of tricks – or relate to any rules. It was just freedom. Kent’s longboards are not standard items. 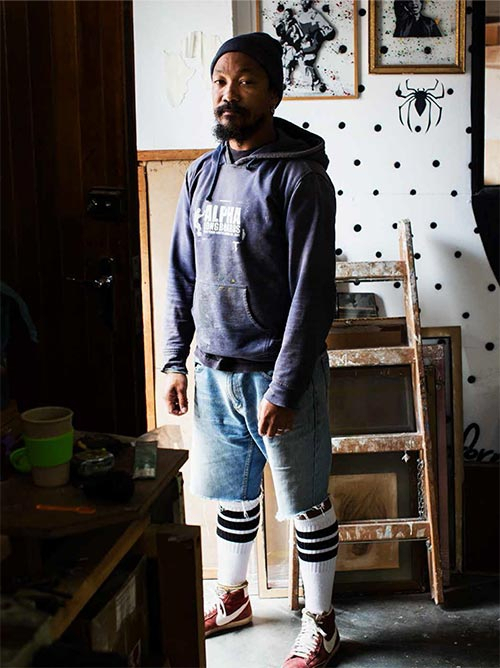 Each board is created based on one of the basic models Kent has in his workshop – then it’s designed and decorated in Alpha’s typical style – based on Kent’s background and the 5–6 artists he works with. Every board is a customized, hand-painted work of art. 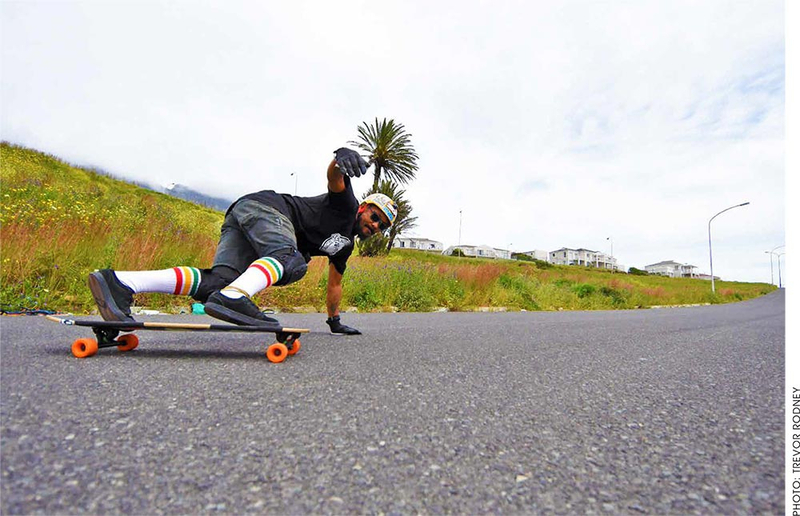 Kent is something of a legend in Cape Town, and we understand why, considering his history, his distinctive riding style, and his warm personality. And what about the competition at the start of this story? Redbull Downhill Cape Town 1999? 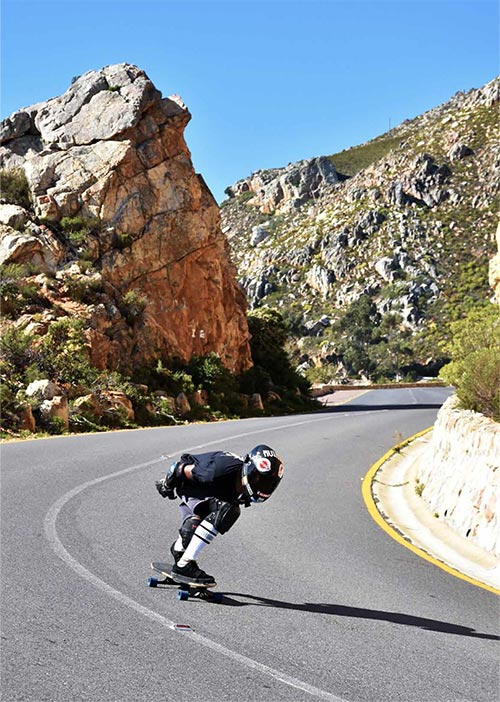 What made a 19-year-old street skateboarder go up the mountain among all the professionals? So despite lack of equipment and the right kind of board, Kent participated, and many of the other participants glanced at him more than once. What kind of odd bird had appeared among them? Unfortunately, it didn’t have a Cinderella ending – that the odd bird easily won over all others. 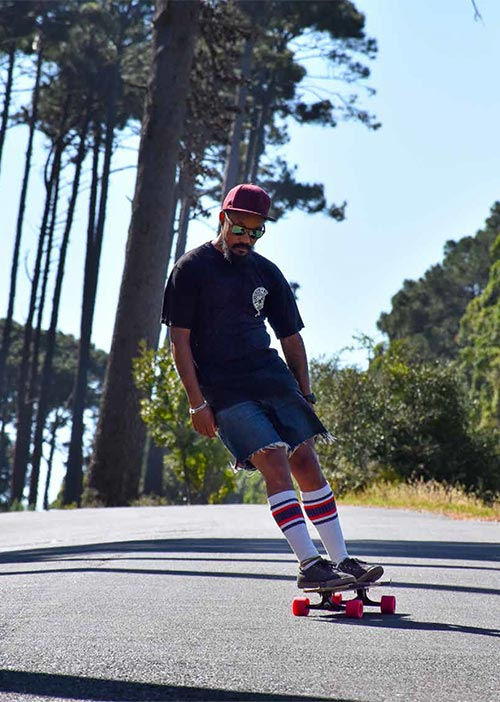 But Kent showed everyone his stamina and finished at a decent placement in the middle in the competition – and a new star in longboard heaven was born. 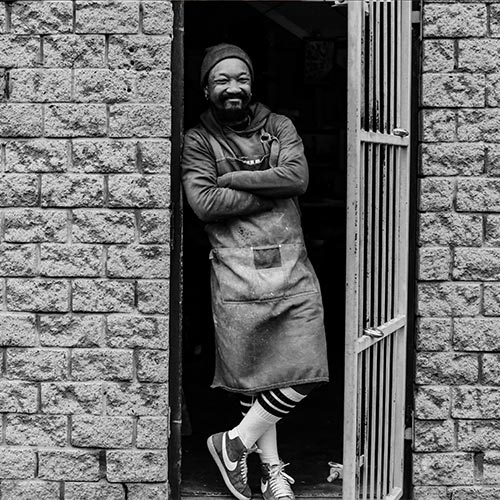 We left Kent sanding his board in his Woodstock workshop and we headed onto the sunny street – an experience and a personality richer. As we traveled along the sea from Kent’s workshop, we glanced up toward Table Mountain and the road that twists down the mountain to the sea. Standing on a longboard or a skateboard and rolling down those slopes, well… they gotta be crazy to do it. on the mountain above a long winding road that leads to the sea. A boy, age 19, stood among them; he was from the suburb Cape Flats. Adidas shelltoes. The competition would start soon. participate – on his usual skateboard. Kent Lingeveldt was the odd bird on the mountain. eboard. His cousin’s old board launched the start of Kent’s career. boarding has been a natural part of his life and career. live with my grandma and my skateboarding cousin, that I thought was really cool. crowd. He’s forged his own trail since he was a young man. The skateboard became his key to freedom. make first boards for the kids. of something, like it was for me when I stepped up on a skateboard for the first time. and do a lot of tricks – or relate to any rules. It was just freedom. 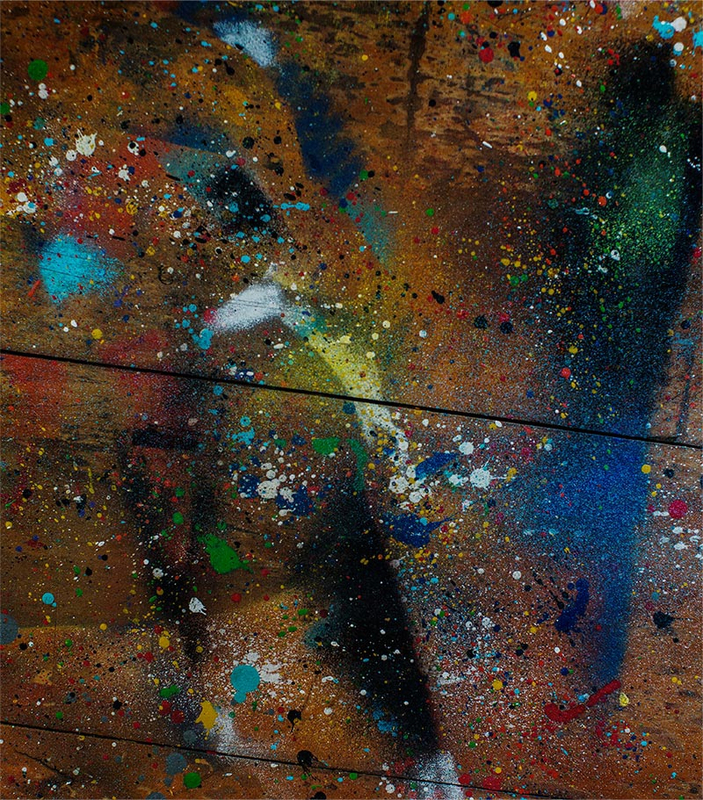 ha’s typical style – based on Kent’s background and the 5–6 artists he works with. 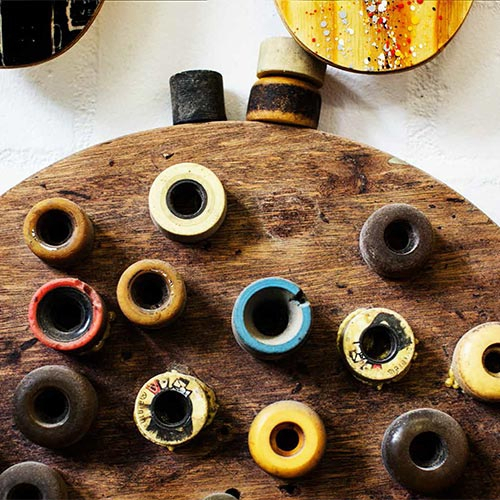 Every board is a customized, hand-painted work of art. 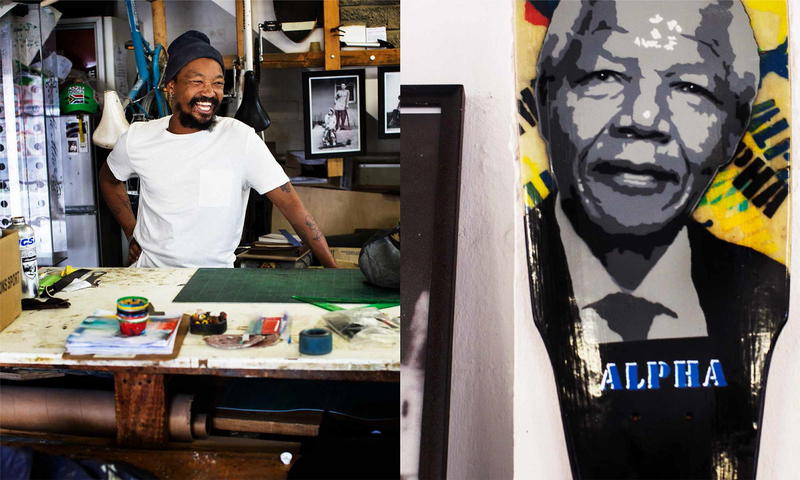 “I grew up right at the end of apartheid, when there were many political discussions. “It’s such a great feeling to make first boards for the kids. To see the expressions on their faces when they realize this is the start of something new. Their possible new life, their future on the board. 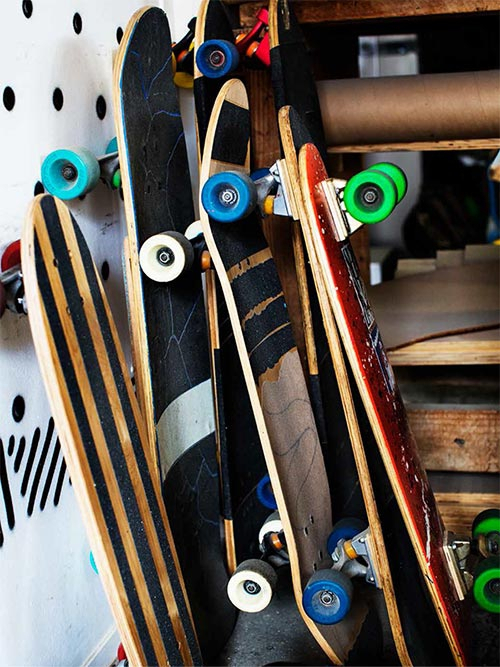 The beginning of something they’ve always wanted to do.” Kent’s longboards are not standard items. We couldn’t help taking a sneak-peek at a photo on the wall behind us. with his portrait on it. Impressive. his history, his distinctive riding style, and his warm personality. bird had appeared among them? rolling down those slopes, well… they gotta be crazy to do it.